Leadermac has been manufacturing moulders to the highest quality standards and offering all the latest moulder technology since 1972. To date, we have manufactured over 10,000 moulders with over 1,100 sold in North America through Leadermac USA. 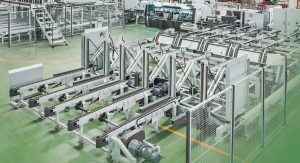 Leadermac offers a wide range of machines from 1-head to 11-head moulders, unjointed to ultra high speed 1,350 FPM or 1,500 FPM jointed moulders. With Leadermac USA, you will find the moulder that can give you the greatest productivity at the lowest unit cost. No matter what your application is, we will have a moulder solution for you. A considerable effort has been invested by Leadermac in establishing a modern production sy stem, which has resulted in greatly increasing production capacity, while lowering production costs. The factory’s highly skilled technicians, combined with their fine craftsmanship, and their great attention to detail at each step of the manufacturing process ensures that we deliver the maximum dependability of operational performance that you have come to expect. When a Leadermac moulder is specially constructed to meet your specific needs, or a new model is re quired, we will work closely with our highly experienced factory application engineers to develop a new machine. 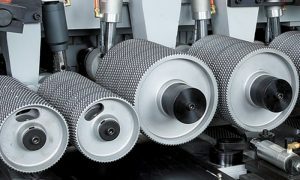 Our sales and service staff’s communication and capabilities, backed by the factory’s outstanding technical support help us design and develop a machine that’s tailored to your application. 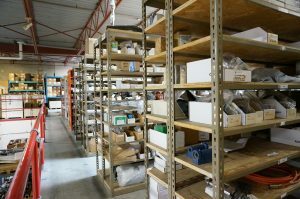 We understand that a machine down will result in a loss in production, which is why our warehouse carries an extensive inventory of spare parts that are readily available to be shipped out to our customers, to minimize production downtimes. If your machine is down and requires a replacement part, give us a call. Our knowledgeable staff are ready to assist you with your needs. Parts can be shipped out with Next Day Air, if required, if ordered before 2:30 PST (5:30 EST). The factory warehouse carries a complete stock of parts. If our warehouse does not have your required part in stock, we can contact the factory and have them send out the part as soon as possible. At Leadermac, we understand the importance of training and after sales service. We appreciate the investment that you have made in your moulder and have made similar investments in our service department by ensuring that we have qualified staff, trained and ready to help you maximize your Return On Investment. For spare parts and service inquiries, please call us toll free at 1.866.522.6835. Our knowledgeable staff area ready to assist you with your needs.